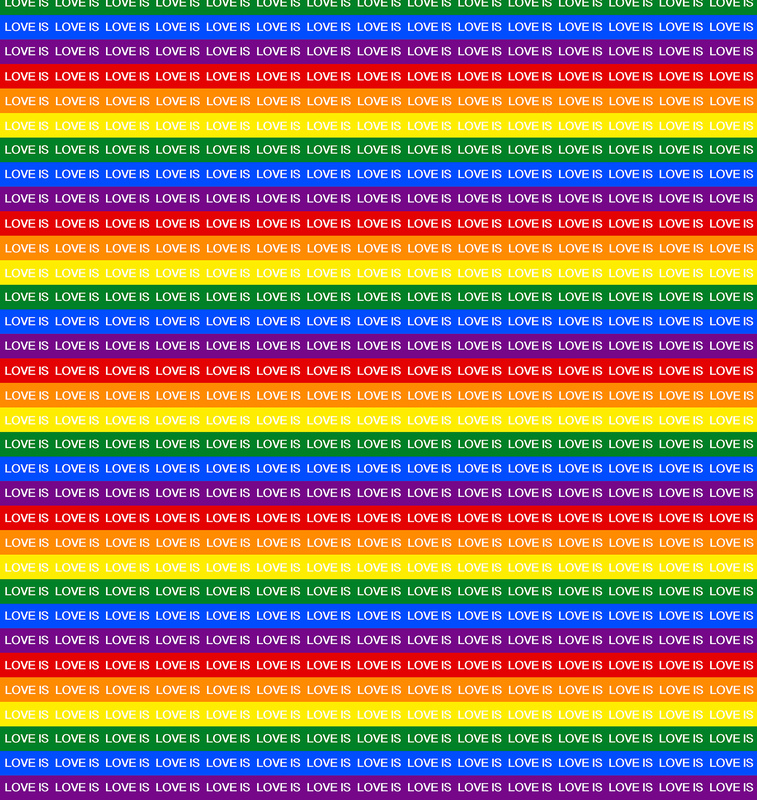 The June 12, 2016 tragedy in Orlando, Florida inspired me to create a print-on-demand fabric at www.spoonflower.com called Love is Love. Once I received my fabric, this Love is Love quilt unexpectedly emerged. I posted images on Facebook and received many requests for a pattern. I've created the patten in lightning speed and it's available now. 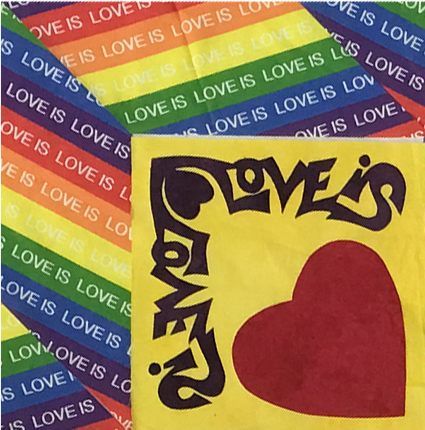 All proceeds from the Love is Love fabric will go to human rights charities. It was Lin-Manuel Miranda (creator of the musical, Hamilton, and my newest idol) who, during his acceptance speech at the 2016 Tony Awards (the night of the Orlando tragedy) said, "Love is love is love is love is love..." It was a phrase that stuck with me. I had the idea to create a Love is Love fabric using the pride colors and Lin-Manuel's phrase. Spoonflower.com allows anyone to create a design and have it printed-on-demand. Spoonflower.com shares profits from fabric with the designer so I decided that ALL proceeds I get from the fabric will go to human rights charities. Here's what the fabric looks like. Here's a swatch showing just one band of all colors. Here is what the fabric looks like across the goods. Each stripe is just a bit wider than 1". 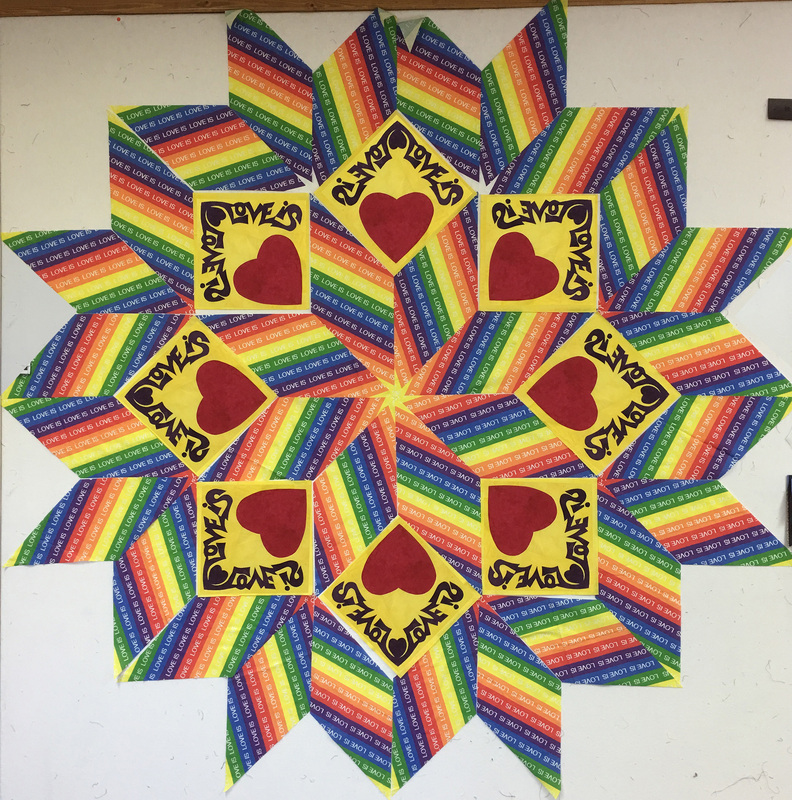 Once I had my Love is Love fabric and was in the studio, I decided to make a small quilt that would allow me to personally remember those who perished in the Pulse nightclub in Orlando. I thought something modest and simple would do. I imagined how the stripes would look as blades in a lone star quilt - so that was the direction I took. Here is what the quilt looked like initially. This option was going to turn out small - and I had more fabric - so I decided to go bigger and make a Broken Star version. I began to explore options for filling in the gaps. I had the idea to write the words "Love is Love" in appliqué" and mirror it where it turned the corners. This softened the edges of the piecing and gave a new look to the quilt which I liked very much. Here is a detail of the "Love Is" appliqué. The hearts were added after the words, but I liked the effect. I then decided to treat the outer border blocks the same way. I think anyone wanting to make the quilt can add as little or as much appliqué as they wish. Here is how the design ended up and the quilt measures 81" x 81". If you wish to make the quilt, you can order the pattern only. It is full-size and available for $19.98. 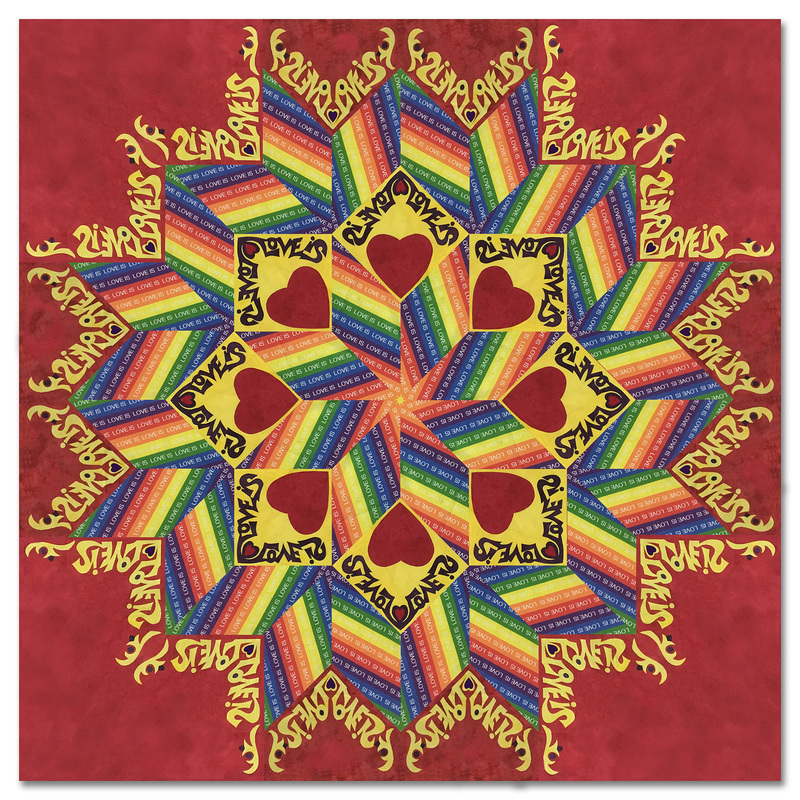 If you wish to use Love is Love fabric in the quilt, you will need 5 yards for this quilt. You must get the LOVE IS LOVE fabric from Spoonflower.com. Be sure to order 5 yards and not 5 fat quarters. Because it is print-on-demand I cannot stock it or provide it. Remember ALL proceeds that I receive from the Love is Love fabric will go to charity. If you wish to get the kit using my hand-dyed fabric, the kit contains the pattern plus 7 yards of hand-dyed fabric for $139.95. The kits are also 'made-on-demand' so please allow 2-4 weeks for delivery. 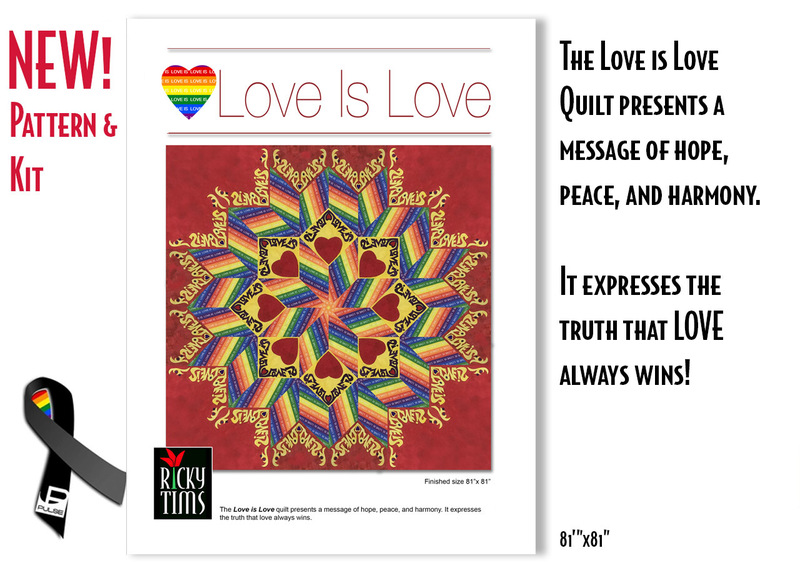 You still must order the Love is Love fabric separately. 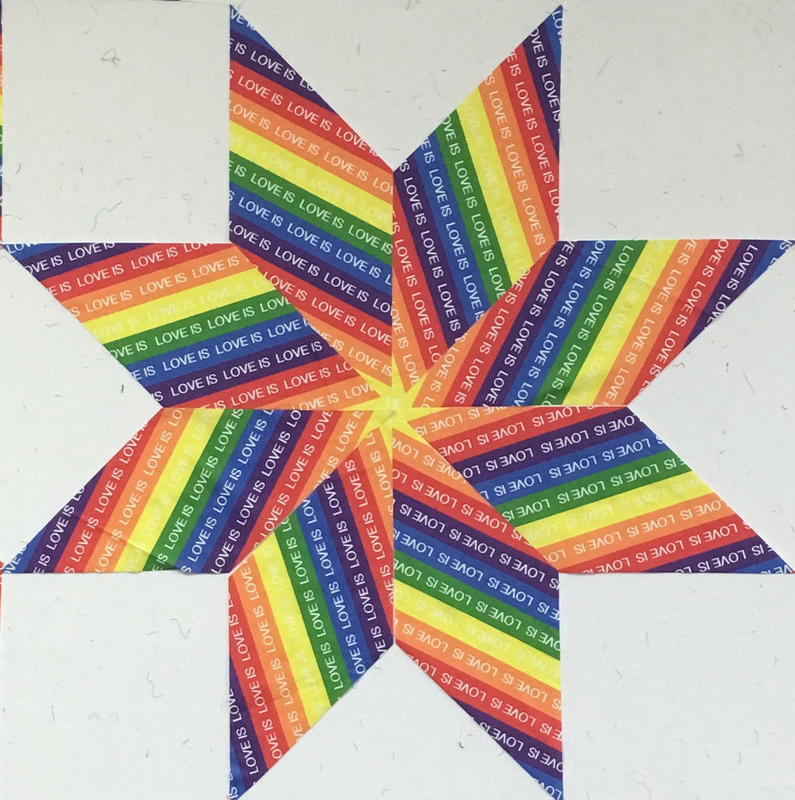 You may also make this quilt using a different fabric other than the Love is Love fabric for the blades of the broken star. May God bless the families of those who were so closely and tragically effected by the senseless tragedy in Orlando. As with so many similar tragedies, may we not forget the innocent ones. Let us remember them and do our part to make change in our world so that they will not have died in vain. As of this writing, my own Love is Love quilt is still in progress. I have chosen to finish it and show it as a reminder that Love always triumphs over hate. 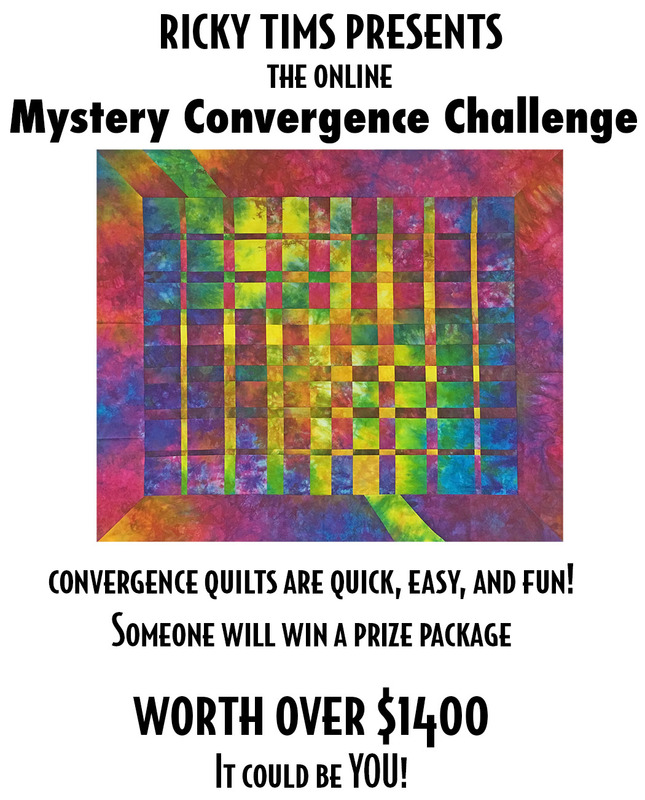 It's Like a Garage Sale for Quilters! It seems quilters like fabric, they love to save, and the love to see quilt. I have an overs upply of my own personal hand-dyed fabric and it's time to purge. On top of that, we need to liquidate all of my remaining commercial fabric. So, with all of those things, we've decided to have a sort of garage sale. That means my studio purge is your stash builder. It's happening in La Veta, Colorado so come on down. I'll be there, so be sure to come say hi! Quilt Luminarium is a two-day comprehensive quilt symposium that demystifies seemingly complex concepts, teaches mastery of unique techniques, and harnesses the power of the ever-elusive muse of creativity. It covers a wide range of topics including innovative piecing, appliqué, quilting, and finishing techniques. Sessions also include design and composition and color theory. 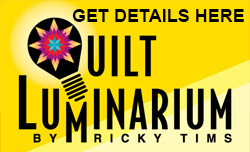 Quilt Luminarium presenter, Ricky Tims, is a longtime entertainer, encourager, comedian, and motivational speaker. He has a unique and pragmatic way to help one realize their full creative potential. He unmasks the creative psyche and reveals common attributes (both good and bad) that creative individuals share. 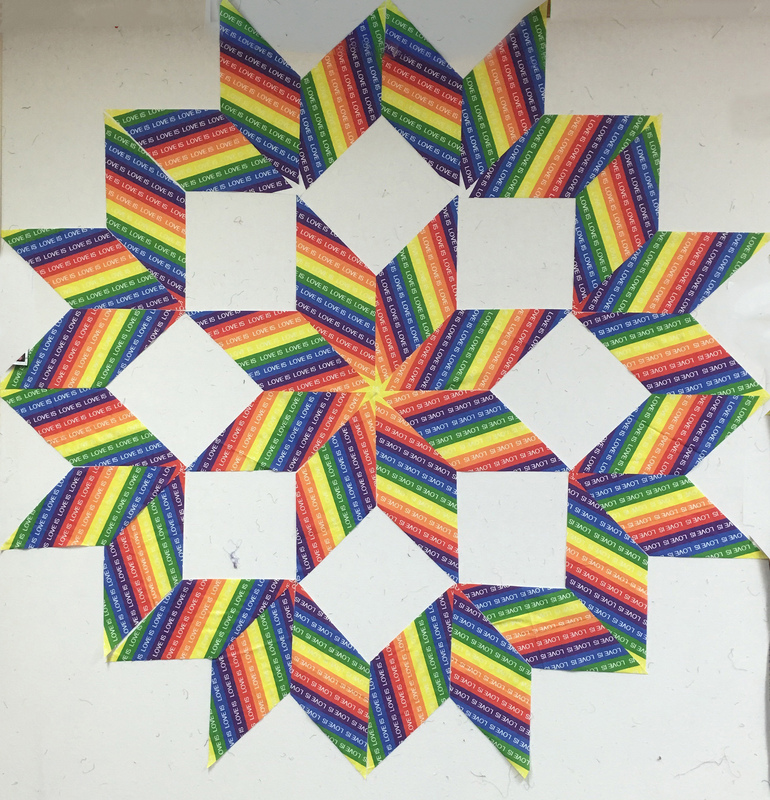 Quilters will learn how to take traditional patterns and make them unique and how a pattern can be adapted to reflect any quilting genre. There is no sewing, no supply list. Quilters won’t be going home with a UFO (Unfinished Object). Everyone attends all sessions. Quilt Luminarium is truly for all quilters from beginner to advanced, from traditional to contemporary, and from modern to art. Each registrant receives full-color syllabus containing all of the information presented! 10th Anniversary Concert in Paducah! 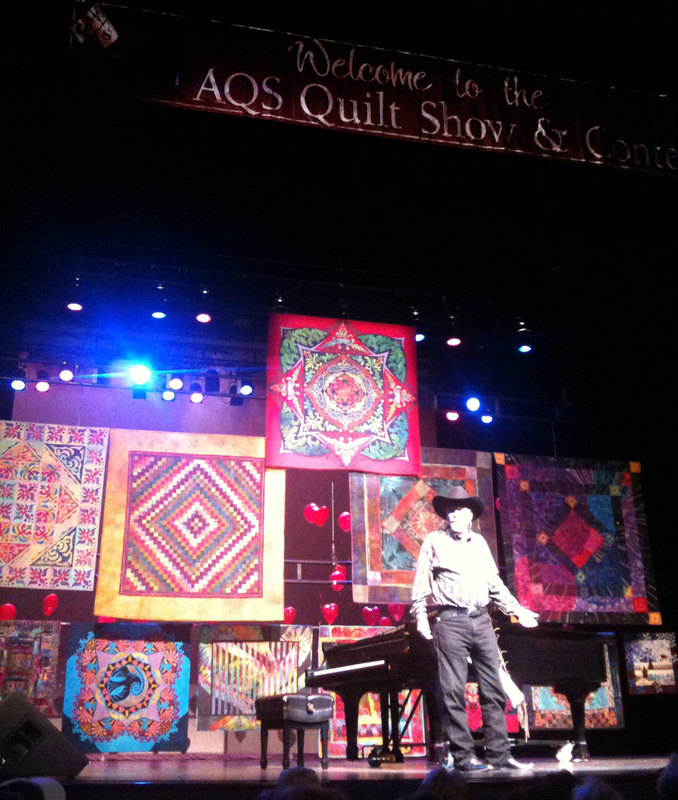 Each year thousands of quilters arrive in Paducah, KY for the AQS QuiltWeek! I have been to Paducah every year since I was a baby quilter in 1992. I grew as a quilter, made friends, and even watched my career grow as a result of AQS having me as part of the Hobbs Fashion Show back in 1998. I love going to Paducah and this year marks my 24th year to attend ( I missed in 2000 due to my move to Colorado). This year is also another milestone. I will be giving my 10th concert at the Carson Center on Friday evening, April 22nd. The stunning European-style concert hall there is my favorite venue in which to perform and I'm looking forward to celebrating the evening with all my quilting friends and family! I sure hope to see you there. If you are coming to Paducah, don't miss it. If you wait until you arrive, be sure to purchase tickets at the registration desk in the days preceding the concert. 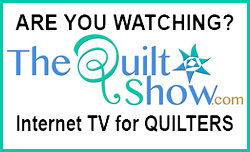 If you have a non-quilting spouse or friend traveling with you - bring them along. This is a fun-for-all event. See you there! Off to the Big Apple - NYC! 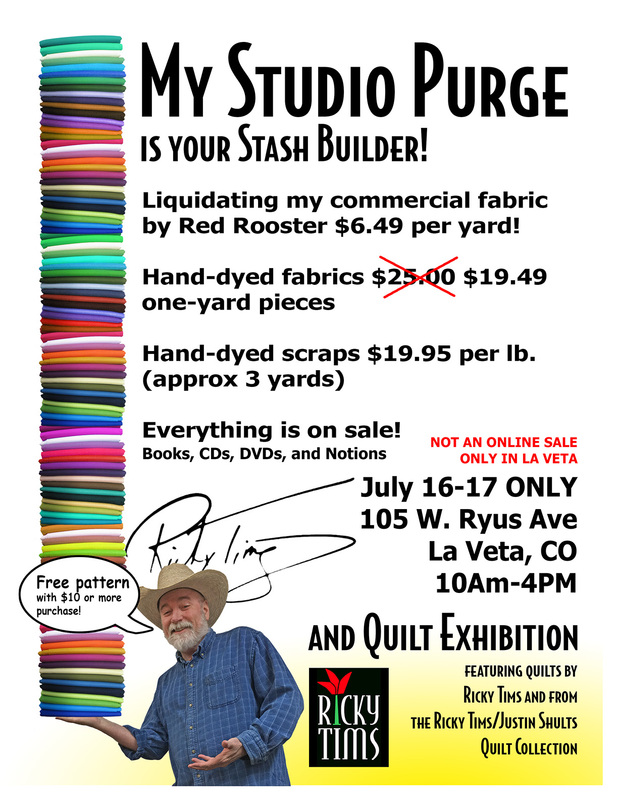 Come Visit La Veta this month! Canada! Having a great time! Bright fabrics for a cold day! Let's Get Together in Delaware! Join me in Ireland in 2015! San Antonio Seminar 4 days left to register! Celebrating: Making a new Quilt! Christmas Shopping Done! Let's Quilt! Quilt Retreat So Much Fun! Creative? Here's a Photo Op! Design Wall - A Must In My Book! Whirlwind Tour Continues - Whoo-hoo! Ashaffenburg, Germany - Let's Eat! All That Jazz - Selections Made! Oodles of Doodles II Nears Release! Look What's New! - Spooky Tree Kit! The Quilt Life - TOP TEN! New Fabric - Sneak Peek! Five Fabric Challenge 2011 Winner! New Quilt Up for Auction! Seminar Update - Still On! The Beat Goes On - and On! It's A New Day in La Veta! 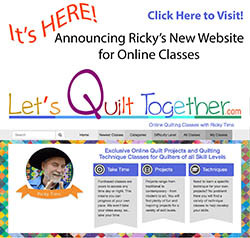 Ricky Tims.com Gets A Makeover! Visit to Amish country provides plenty of photo ops.